All 13 episodes from the first season of the action adventure following the Marvel Comics superhero. 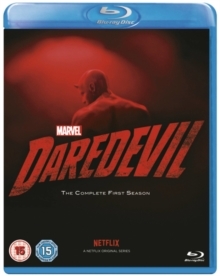 Idealistic lawyer Matt Murdock (Charlie Cox), along with his long-time friend Foggy Nelson (Elden Henson), uses his newly established firm to tackle the rising levels of criminal activity in New York City. By night however, Murdock - who was blinded by a chemical spill as a young boy - uses his heightened senses to fight crime on the streets as vigilante Daredevil. With the influence of underworld kingpin Wilson Fisk (Vincent D'Onofrio) continuing to grow, Murdock faces a fight on two fronts to keep the city safe. The episodes are: 'Into the Ring', 'Cut Man', 'Rabbit in a Snowstorm', 'In the Blood', 'World On Fire', 'Condemned', 'Stick', 'Shadow in the Glass', 'Speak of the Devil', 'Nelson v.
Murdock', 'The Path of the Righteous', 'The Ones We Leave Behind' and 'Daredevil'.